What is a product development workshop? Why hold a product development workshop? In software development, collective thinking thrives during workshops. For some, workshops may seem a significant commitment of time, and for this reason people tend to avoid having these sessions. However, with their social energy, engaging dynamic, and intense focus, workshops can fuel your team’s progress on a project like no other technique. In this article, we’ll demonstrate that the time spent on workshops is never wasted, and help you turn a workshop into a powerful tool in the process of product development. As a matter of fact, we have already addressed design sprint workshops. Check it out if that’s your primary interest. A facilitated product development workshop (PDW) is a planned, time-bound technique aimed at gathering members of the product development team with their variegated expertise to collaborate on product development tasks. Unlike regular meetings, PDWs help to align the vision across a product team and leverage the contributions from different proficiency areas. The participants usually include a client, key stakeholders, and a project team. Every product development workshop (PDW) has definite goals that should be reached, bound by the artifacts that should be obtained as a result of the session. Workshop deliverables include product vision boards, product roadmaps, product prototypes, etc. Workshops are most effective in the early stages of the product or feature development lifecycle for chartering, planning, requirements, analysis, and design. A well-facilitated workshop not only can provide the project deliverables in a fast, high-quality manner, but it can also contribute to building a team and establishing effective collaboration among its members. 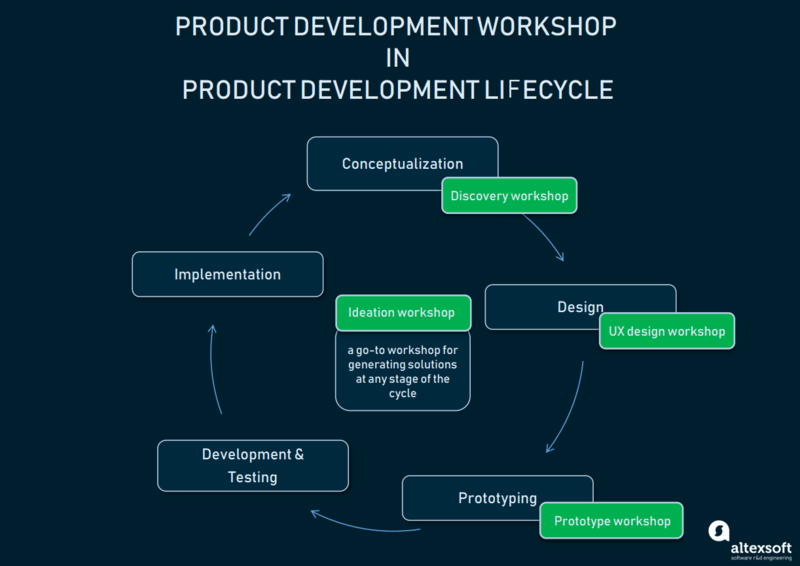 In this article, we’ll cover the most common workshop types within a product development lifecycle: discovery workshop, UX design workshop, ideation workshop, and prototype workshop. However, you can always use this instrument to gather the leading minds for brainstorming solutions to the problems your project stumbles upon. Further, we’ll elaborate on the key aspects of a PDW, and give advice on how to apply this technique beyond the actual workshops that we mention. Discovery workshops are done at a project’s conceptualization phase. It is a reciprocal dialogue engaged in by the team developing the product and the client partners to inspire openness and transparency between the two groups. In addition, you might need to hold a discovery workshop when contemplating big changes like taking your product to a new market, adding features, or redesigning the user experience to sustain growth. define the metrics to monitor and evaluate the progress of the work. Target participants: client, key stakeholders, the project team. Deliverables: Product vision board, product roadmap, UX strategy canvas. A product vision board captures a product vision, pinpoints strategy including user and business goals, while identifying assumptions and risks. A product roadmap marks the general stages of product development: time-bound objectives, features, status markers to track progress, etc. For more details, see our article where we elaborate on the product roadmap, its features, and types. 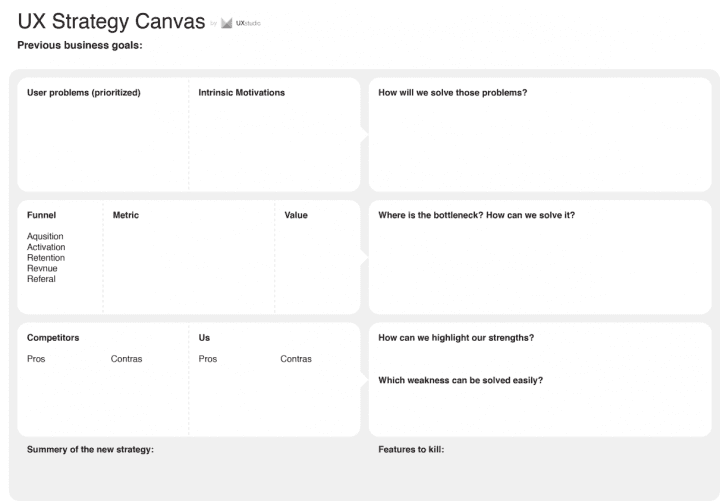 A UX strategy canvas highlights the results and ideas of the workshop. The collected information is on the left side: pains and motivations, the AARRR funnel analysis, and the competitor analysis. The right side expands with the ideas about each finding on the left, and the bottom contains a summary of the findings. How can we solve users’ problems with our product? How can we stand out in the market? Where are the bottlenecks in the product’s metrics and how can we solve them? Moving from “everything is possible” to “here’s what’s relevant,” a facilitator narrows down the number of ideas. Principles are the guiding concepts against which we measure our decisions. Goals help define what we want to build. Vision is an aspirational description of what we want to accomplish together. Get your focus right. You should concentrate on validating problems. Don’t rush into building solutions, as this product development stage is all about deciding on the feasibility of building the product. Push the discovery work. At the end of the workshop, you should be confident about who is going to use your product and why, what makes your product stand out from the crowd, and what value it’ll bring to your business. If you still don’t know the answers to some of the questions after the workshop, continue the discovery work, or look for another product idea. Keep the goals in sight. By hanging your product vision board on the office wall, you make it accessible for everyone at all times. This way it’ll remind the dev team why the project is carried out without interfering with their workflow. Timebox your product discovery work. It’s hard to predict how much time idea generation will take. However, without limiting the time for activities, the process risks getting out of order. Therefore, setting a time box makes sense. At the end of it, the work stops, and you reflect on what’s been achieved. If the work has not been completed in time, and your product strategy and business model still need clarity, there are two options: add another time box or stop the work. You’ve identified the cornerstones of your project at the discovery workshop. Now the bulk of the UX design work needs to be done. So here comes a UX design workshop. Target participants: Everybody in contact with the users: marketing expert, business analyst, UX designer. It’s not recommended for stakeholders and key decision makers to attend a UX design workshop. They should give their feedback on its outcomes later. This allows the team to be more creative in their ideas. 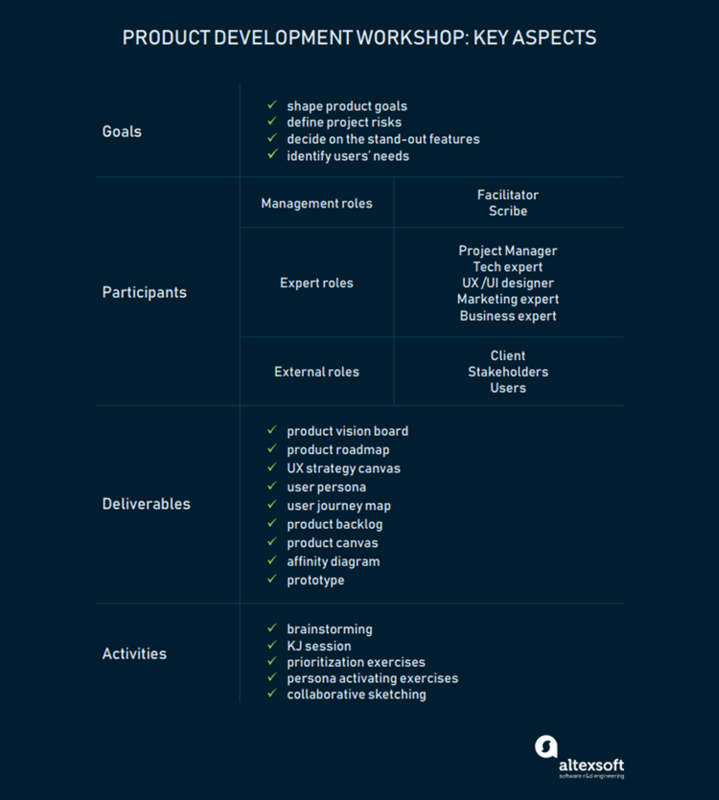 Deliverables: user persona, user journey map, product backlog, product canvas. 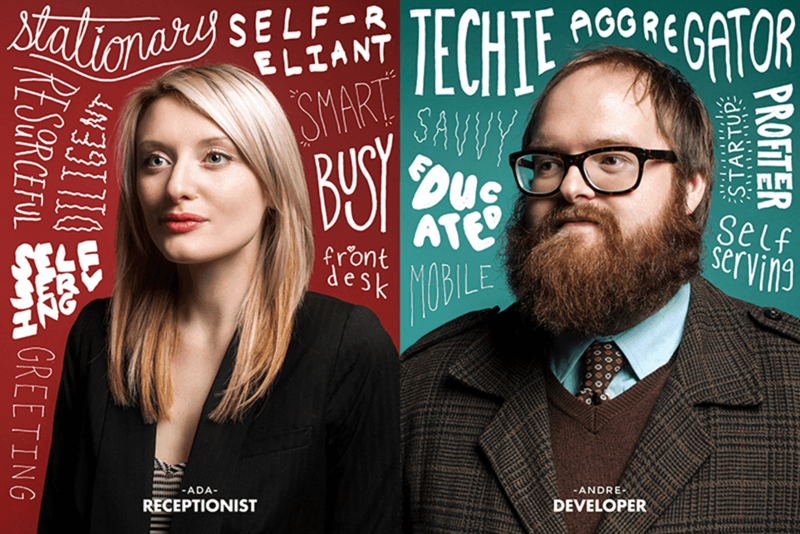 User personas are fictitious characters who embody specific key characteristics of target user groups. It makes sense to create user personas at the beginning of the work in order to have the users in mind throughout the design process. A user journey map shows the user flow inside an application. 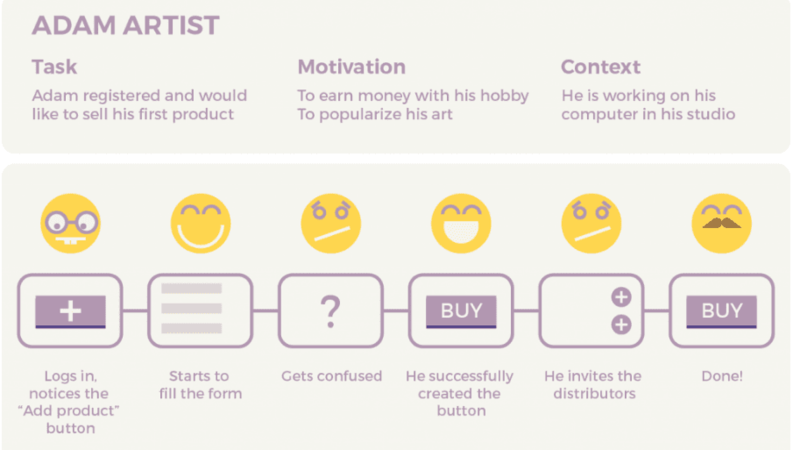 Here’s an example of a user journey in the RightNow app describing the creation of an embedded “Buy now” button to help visitors buy the work from the blog post with one click. This map determines to which user persona and goal the journey belongs to, which forces drive the persona, and what kind of environment the process takes place in. A product backlog is a prioritized list of tasks (features, functions, technologies, enhancements, and bug fixes) for the development team based on the team’s roadmap and requirements. Usually, a product backlog consists of user stories, critical product design, and UI requirements. 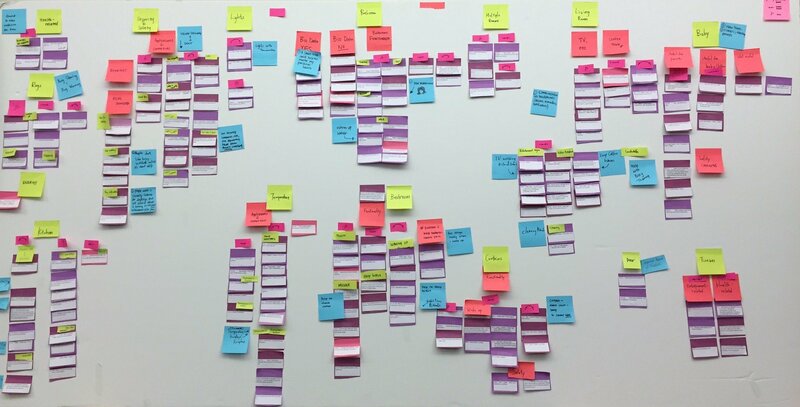 All the work accomplished by this time – in particular: product vision board, personas, user journeys, and user stories – serves as input for the product canvas – a structured and multi-dimensional map that connects personas with product features. Thematic content analysis aims to find common patterns across a data set. On getting familiar with the data, label the whole text searching for themes with broader patterns of meaning. Narrative analysis: comparing the gathered stories, look for insights and meanings. Create a new story that connects the previous ones in a novel and insightful way. A deductive approach: stories are contrasted with the pre-existing theories. To go about developing UX personas, first, present the findings of the user interview to the group. Then separate people into subgroups to fill out the persona template. Let groups present their personas. In the end, compare different personas, discuss patterns, resolve conflicts. Naming users, visualizing them, coming up with quotations they might utter, all that makes user personas more memorable. 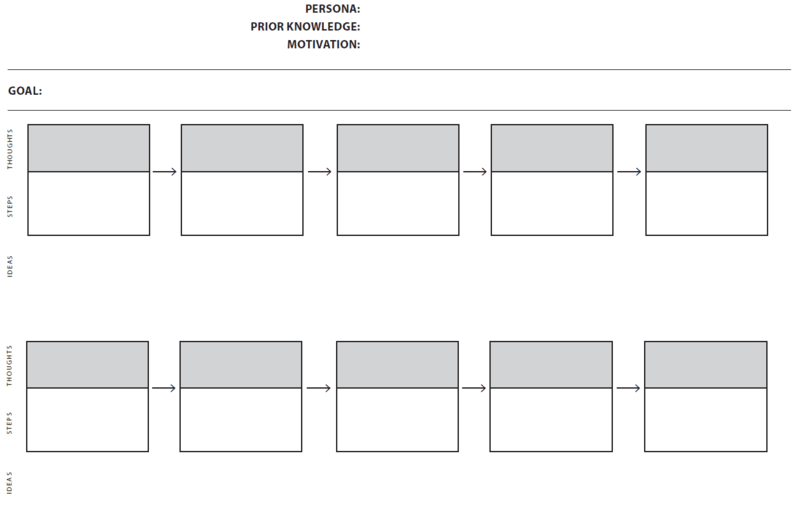 Prioritization exercises help the group understand the persona’s needs. For example, you can brainstorm your persona’s needs using an exercise known as 20/20 Vision. Put the first need on the wall, then the next one, and ask: “Does [John] think it’s more or less important than the previous one?”. Repeating it with all the needs, you’ll get a prioritized list. Knowing users’ problems and motivations after generating user personas, the team now can determine the most important goals to achieve with the application, and design user journeys accordingly. First, the team reviews what the users do and in what order. The goal is to discover many different versions for each journey. What’s more, write imaginary user thoughts above the steps or draw emoticons as reactions to the experience along the journey. 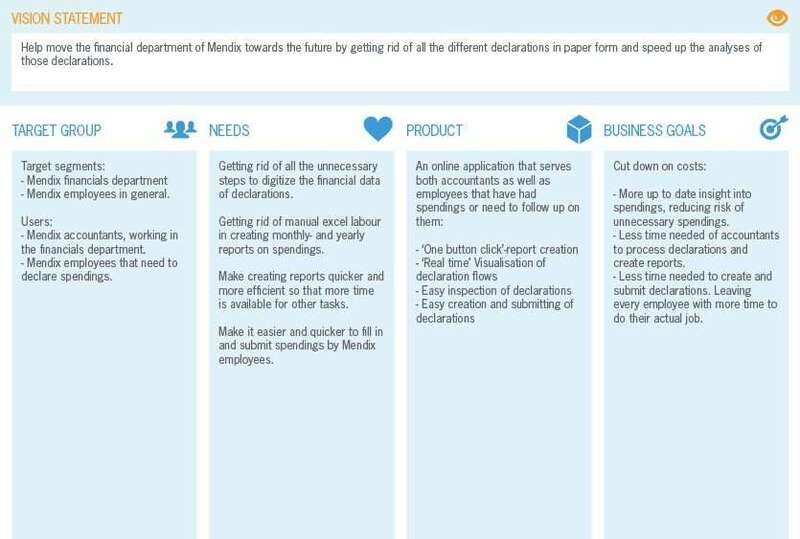 At last, having come up with several solutions, you decide what changes should be made from a tech standpoint, what should be put on one screen, and what on separate pages. Allocate enough time for the workshop. A thorough UX design workshop, including persona building and user journey mapping, can take up to two days. If you want to just get the bare bones to set the ball rolling, plan for at least four hours. Update product backlog. As you learn more about your users, add the latest insights to your backlog to keep it workable. This ensures that you develop the right product in the right way. Ideation is the creative process of generating, developing, and communicating new ideas. That’s why running an ideation workshop can be of great help, should there be an issue needing a solution. define project risks and ways of preventing them. Target participants: It’s crucial to invite representatives of every team that will have a hand in working on the project. Deliverables: affinity diagram, solution sketch. An affinity diagram is a mind map that gathers large amounts of data: ideas, opinions, and issues in a classified manner. There are many online tools for making affinity diagrams: RealtimeBoard, SmartDraw, upBOARD, etc. Brainstorming technique “How might we?” to come up with as many solutions as your team can imagine. Once you’ve defined the area to explore, frame the problem to a “how might we … “ format to move your team toward generating solutions. Then prioritize the best ideas, build on them, and work them into the next steps. A KJ Session is a collaborative activity for setting priorities, named after its creator Jiro Kawakita. First, you decide on a focus question upon which the activity will be built. The focus question should reflect the workshop goal. On gathering the group, provide them with post-its for writing their answers to the focus question. Then everyone puts their notes on the wall in random order. Now arrange answers that belong together into groups and name them. Once that’s done, vote for the most important groups. This will help you rank the groups by the number of votes. The most voted for groups are the priorities. Next, the team discusses how they understand the priorities. They may make some adjustments by combining some groups. In the end, the team gets solid priorities they all agreed upon. Crazy 8’s: a paper folded in eight sections where team members sketch eight ideas. After that, the participants explain their best ideas. This will allow ideas to enrich each other. Solution sketch: bearing an idea in mind, draw it in the form of a framed storyboard. Include explanations beneath each frame of what’s happening. Then vote for the best solution sketch. Draw Boundaries. Along with clearly stating the workshop goals, be sure to set boundaries while framing the problem to be solved. A facilitator should guide the discussion back to the focal point if someone wanders away from the topic at hand. Share the output. What happens after is as important as the workshop itself. Sharing the artifacts or discussion points with participants can inspire conversations to continue, draw additional insights, and allow those who failed to attend to contribute as well. A finishing line in the UX design part of the product development journey is prototyping the proposed solutions – giving them a tangible form. At the end of the workshop, you have something to test with the end-user. Target participants: Project manager, tech experts, UX and/or UI designers. You can read more about prototyping and its deliverables in our article on UX vs. UI. Collaborative Sketching bridges the gap between ideation and prototyping. Everyone gets a sheet of paper and a pen for sketching either different ideas or the same one for enriching it with details. Timing is tight – there’s only one minute to sketch and then the sketch is handed over to the next person who adds to the sketch. Sketch circulation ends once everyone has contributed. The workshop proceeds with presenting and discussing the outcome in the group. 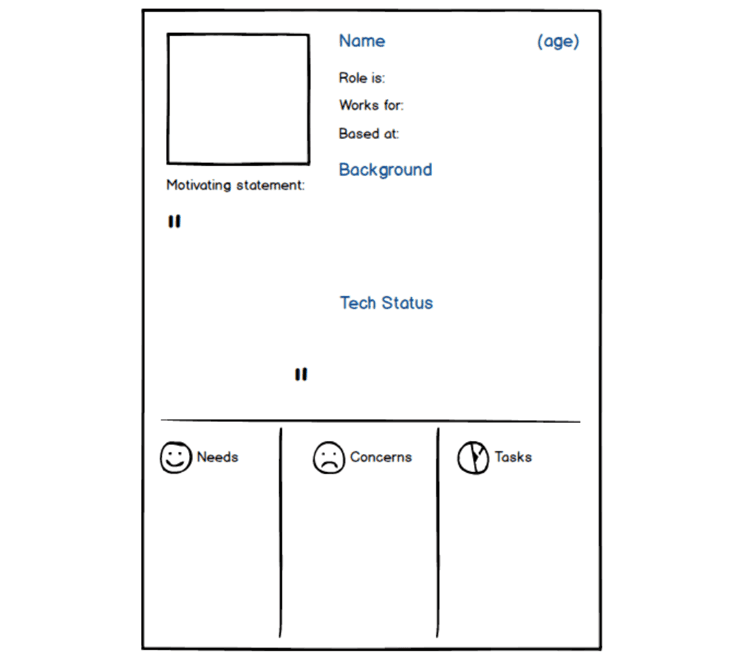 Creating a basic clickable prototype using, for example, iPhone screen templates. Divide the team into subgroups and task them with creating at least 4 frames of the app for their service using key features. Once they’re done, they can upload their sketches to the POP App that allows for making elements clickable and creating flows from one screen to the next. Then prototypes are shared and put on the projector. Each subgroup delivers a 2-minute presentation of their prototype. After each presentation, invite other groups to build on the app concept, suggesting how it could be further developed. Explain the basic function of the POP App beforehand, so that every participant can keep up with the prototyping process and contribute their ideas to it. Don’t aim at perfection. The purpose of a prototype workshop isn’t to create the perfect solution; it’s to make sure your solution is on target. So don’t waste time on sophisticated models. 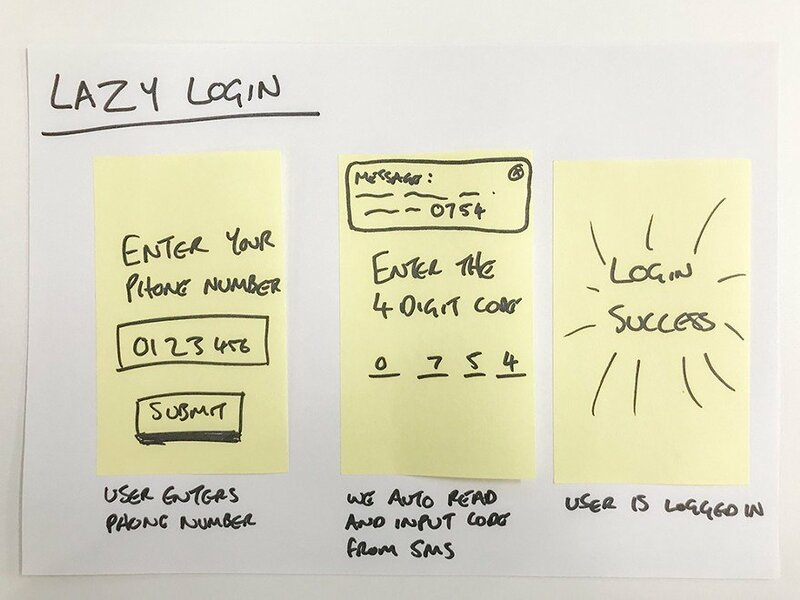 Build a simple prototype of your idea to get user feedback as quickly as possible. You’ve probably noticed that there is no universal agenda for each session. Every workshop is designed for some particular need. On analyzing the issue at hand, you can establish the goal for the workshop and decide on the deliverables to support this goal, gather the relevant participants, and choose the activities to maintain active collaboration. The workshop’s goal explains the reason for gathering the players together, frames the topic of discussion, and it must be evident to all participants. Because the workshop’s context is set by the project, its goal is linked to the project’s current business situation, the desired situation, and the obstacles to achieving it. A good practice is to articulate workshop goals in the form of actions. For example, “to discuss our vision for the project,” “to brainstorm solutions for a certain problem,” or “to draft key principles in approaching the design of the project”. Ideally, workshops are composed of a healthy mix of business experts or product development people representing them, tech specialists, and stakeholders. Besides them, there are management roles including a facilitator who runs the session, and a scribe assisting him or her. However, the team structure depends on the goal that must be achieved. The facilitator is the glue that holds the workshop together. They are responsible for managing the group’s activities, dynamics, and work products. You can develop skilled facilitators within your organization or use outside help. In the former scenario, these can be individuals directly interested in the results of the workshop, as it’ll influence their further workflow (UX designer, business analyst, etc.). In Agile project management, there’s a scrum master who facilitates collaboration and advises on the best tools for visualizing and tracking the process. To learn about Scrum team and roles, check out our article on Scrum process best practices. The facilitator should remain neutral and encourage the group to work together pursuing the goal that was initially set. Scribe. This role is optional, although it’ll be helpful for a facilitator to have a scribe or an illustrator for capturing everything that happens in the meeting in a comprehensive and organized manner. It’s also much easier to review ideas after the workshop if there are visuals included. Project Manager: the head of the team that manages development. Read more about the project management practices and methodologies in our whitepaper. Tech experts. Testing team and development team representatives must be present to advise on technical feasibility, identify technical risks, and build prototypes. Involving more people from the development team will prevent misunderstandings and knowledge leakage along the way. As a result of obtaining first-hand information, the dev team will deliver the right solution faster. The UX and/or UI designer visualizes the project ideas with the end user’s needs in mind. 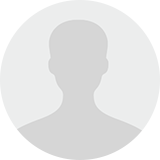 They are primarily responsible for observing and interviewing users. Marketing experts. This can be a product marketing manager or a sales representative who takes care of how the end user will perceive the product. They get the team in touch with target users and do competitor research. Business analyst: a business domain expert. Client. A key decision maker, the product development process heavily depends on what kind of business they own. Key stakeholders: significantly affect decision-making and the outcome of the project. They can be people from marketing, sales, and support. Users. By engaging real users you get to identify their perspective and needs more accurately, which significantly affects the decision-making process regarding the product. A workshop delivers work artifacts needed by the project. As a rule, participants create deliverables using visual media: posters, pictures, sticky notes, cards, diagrams, text, etc. Starting old-school with pen and paper can oftentimes boost creativity much more than a digital canvas. To maintain energy, creativity, and motivation, a facilitator organizes different group activities that are engaging and relevant to the content. Activities may consist of several steps in which members work individually, parallel in subteams, or as a whole group. For example, subgroups can be formed to work on different deliverables: One group is designing use cases, while another is drafting a prototype, and the third one is creating a high-level class model. Then the subgroups reunite in a whole group to share and review their work. In effective collaborative groups, energy is high, individuals respect one another, skills are complementary, and responsibilities and roles are clear both inside and outside the group setting. Here are some important recommendations for your workshop’s success. Select a skillful facilitator. The productivity of PDW greatly depends on the facilitator. They lead the processes to achieve goals, and in order to do that, they should be able to understand and balance groups of people with competing needs, desires, and opinions. A facilitator must be knowledgeable in the subject business domain to be able to ask the right questions that elicit the needed answers. The facilitator should understand that participants may have distractions or objections to an experience like this. They need to know how to respond to such remarks as “I’m not creative,” be able to encourage participants to trust the process and convey the message of their importance: Every member’s contribution is vital to get the full picture in the end. For this purpose, it is necessary to create a safe environment that will make everybody feel comfortable with sharing their insights. Identify the right participants. While you have to make sure to include a representative from every specialty, it’s important to keep only the relevant members. By limiting your meeting attendees to the people who need to be there, you help create a more efficient and on-topic discussion. Encourage participants to prepare for the workshop. By providing adequate information in advance, attendees will have an opportunity to conduct their own independent research. This will result in better, more focused questions at the outset. Create a balanced and achievable agenda. Don’t let your workshop schedule be overstuffed with activities. With interesting content to discuss and an engaged team to participate, any activity will take about 90 minutes or so: setting up for the activity, understanding the task, doing the activity, reflecting on the accomplishment, sharing out and discussing the content created. That’s not counting breaks. A one-day workshop has room for 3 to 4 activities; A two-day workshop, 6 to 8. Avoid the illusion of shared understanding. When all participants immediately nod in agreement with some suggestion, it’s quite possible that they’re just losing focus. That’s when a facilitator needs to step up and challenge the head-nodding attendees. Ask them to articulate why they’re in agreement. Good if they really have strong reasons, but if not, you’ll have to dive deeper into discussing the point. Create lightweight documentation along the way. Some types of workshop activities, like sketching, naturally output artifacts that can be immediately used by anyone taking the next step on a project – this could be user experience, design, or engineering. Therefore, it’ll be very useful to summarize your discovery findings by taking photographs of your sketches or composing the generated data in a simple set of slides. Many of these artifacts will be referenced throughout the project to get feedback. Allow for assessing workshops. Facilitators need constructive feedback to improve workshop organization. Once they have it, they know what to work on. Create opportunities for eliciting honest feedback from everyone involved, perhaps by soliciting anonymous assessment. Starting a development process with a workshop is a good idea as it helps to organize the teamwork and communicate a common vision to every member, as well as allowing for a smoother transition to production. provide a 5 to 15 percent overall savings in time and effort of the whole project. Generate fresh ideas. At the workshop session, where all relevant knowhow is represented in a single room, attendees most likely will contribute to the problem from different perspectives. The important thing is to convey to the participants that each of them weighs in. Inspire personal involvement. Being involved in hands-on product discovery, workshop participants are more likely to be highly engaged and provide helpful support and ideas along the way. Moreover, close collaboration powers team spirit. Improve communication. In software development, the absence of proper communication from the beginning increases the risk of failure. It can lead to misunderstandings, over-interpretation, missed expectations, etc. Because of their interactive nature, well-facilitated sessions can build trust, foster relationships and consensus, and improve communication among the participants. During PDW, clients get to know the team and can directly communicate their vision of the product to make sure the team is on the right page. At the same time, the team gets a chance to specify the requirements, so there’s no place for ambiguities to hide. Get a better understanding of the whole project. The more that detailed analysis is undertaken before development, the less likely you’ll stumble on unexpected issues and additional costs in the development phase. Here PDW comes in handy. Сollaboration builds a shared understanding of what we’re delivering and why. Intensive discussions unveil uncertainties, risks, and weak points. They also allow for estimating time, cost, and framing the scope of work. Designers and developers get a clear picture of the product assumptions, their context, users, and business needs. Reach consensus on contradictory points. A workshop aims at coming to a conclusion that can be accepted by all members of the group. A single person can block consensus if he or she considers it necessary. In this case, the group will keep looking for the next most acceptable alternative for all parties. As the saying goes, the truth is born of arguments. Accelerate the project. Workshops are more efficient in managing time compared to one-on-one meetings. As time-to-market is crucial in achieving a competitive advantage, the use of workshop concepts for product development becomes essential. At one meeting the team is able to accomplish the results that otherwise could take weeks. In four hours: a project team defined the deliverables for the upcoming design phase, distributed responsibilities, determined the quality criterion, and mapped it into a timeline with dependencies.